Police came across an abandoned vehicle on Highway 56 near I-25 at 12:52 a.m. The vehicle appeared to be inoperative. The Joe to Go building was shot with paint balls sometime during the previous night. A large black dog was reported running loose near the Guaranty Bank but the officer was unable to locate the animal. Police received a REDDI (Report Every Drunk Driver Immediately) report involving a red Dodge pickup truck with a Wyoming license that was weaving back and forth while driving down Mountain Avenue. They were unable to locate the Dodge. Dog kennel building materials were reported stolen from a residence in the 200 block of East Colorado Avenue. Four calves got away from their moms and onto South County Road 17 near Spartan Avenue. The apparently found their way back or were herded back and the police officer could not locate them. A barking dog on East Michigan Avenue was quite when police arrived. Rather than cite an individual for public drunkenness, The officer gave an intoxicated man a ride home at 1:20 a.m.
Police stopped a vehicle in the 300 block of Turner Avenue. The driver, 18-year-old Kyle P. Wright of Loveland, was arrested and charged with Driving Under the Influence of Alcohol, Underage Consumption/Possession of Alcohol and Driving While Driver’s License was Under Restraint. Vehicle passengers, Bryan A. Quintero, a 20-year-old Larimer County resident and Samantha Gardner, an 18-year-old Berthoud resident, were issued citations charging Underage Possession/Consumption of Ethyl Alcohol. Police assisted with traffic control at Pioneer Sand and Gravel when a fire in the mulch piles sent heavy smoke across the road. A white sedan with loud music at Berthoud Park was quiet when police arrived. Neighbors on East Iowa reported that a family had moved out and left their dogs. The report is listed as unfounded. A reflective sign knocked down on County Road 17 near 10E is listed as a traffic hazard. The call was referred. Police helped out when the railroad-crossing gate on Welch Avenue stuck in the down position. Police gave an assist to a motorist whose car had run out of gas on U.S. Highway 287. A mobile phone was found in the 600 block of Fourth Street. A black dog was reported on the loose in the 500 block of Ninth Street. With the assistance of the officer, the owner came out of the house and retrieved the animal. Police received a possible REDDI report, but after following the vehicle the officer had no probable cause to make a traffic stop. Police again received the “false” report of dogs abandoned on East Iowa Avenue. Police are investigating the theft of keys and a cell phone, both items reportedly missing from a residence in the 200 block of Second Street. Police made several traffic stops near Berthoud Elementary and issued verbal warnings to the drivers. Once again, police received a call about abandoned dogs on the East Iowa Avenue. The caller was told that the people did not move and abandon the dogs. The renters are due to move on April 14. Police were called for a case of disorderly conduct at Turner Middle School. Police conducted a welfare check in the 900 block of Seventh Street. Officers looked into a “cold” theft in the 900 block of Tenth Street. Police received a report of juveniles congregating in Town Park. However the youths left as police arrived. However, the police found a glass pipe in the park and received a good description of a juvenile who had put something in his back pack. Police located the youth at the high school and found a glass pipe with Marijuana in his back pack. The 16-year-old Larimer County male was issued a summons charging possession of Marijuana and drug paraphernalia. A report of suspicious activity at the Berthoud Town Reservoir at 8:30 p.m. turned out to be students from the astronomy class looking for a dark place to view celestial bodies. Police received a REDDI report about a vehicle on Highway 56 east of town. The police were able to stop the car and determined hat the driver’s license had been suspended. A summons was issued. Staff from Grace Place reported someone behind the Sonoco building. The individual in question was homeless. A set of keys found in the Pinewood Mobile Home Park were turned over to police who were able to return them to their owner. Police were able to return a lost dog, however, the pet was accompanied by a citation. A barking dog complaint in the 300 block of Bimson was handled by the officer. Police finished off the day with three traffic stops on County Road 17 near Bunyan Avenue. All three drivers received summonses. Between midnight and 4 a.m., police made three traffic stops west of town. Only one of the drivers was cited. A resident of the 600 block of Welch Avenue called to report a sewer backup. Police were unable to locate juveniles who had been observed putting an unknown substance on a vehicle parked near Turner Middle School. Kids in a tree in Fickel Park were given a verbal warning. Jana M. Sheel, a 45-year-old Westminster, Colorado resident, was cited for disorderly conduct following a verbal disturbance at the Subway restaurant at 9 p.m.
Purse found, purse returned, all accomplished by 7:30 a.m.
Police assisted a motorist who had a flat tire on U.S. Highway 287. A mid-afternoon barking dog complaint in the 1900 block of Seventh Street was handled by the officer. A non-injury motor vehicle accident reported on north Highway 287 was gone when police arrived. Another call about an accident on U.S. Highway 287 came in 45 minutes later but police were unable to locate any accident. Police received a report of a child throwing rocks at another child at the skate park. Three gnomes were found on County Road 19 and were turned over to the Larimer County Sheriff’s Office. In a case of criminal mischief, the ceiling in a boy’s varsity locker room at Berthoud High School was damaged. McKee hospital sent a weapons report. A Berthoud resident shot himself in the foot with a BB gun and went to the hospital to have the BB removed. Police went to Bristlecone Court after a complaint about a barking dog. The officer reported that when he arrived, the dog was not barking and did not bark for the 10 minutes he spent at the location. 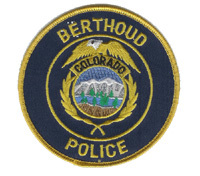 At 11 a.m. dispatch received a report about juveniles at Berthoud Town Park throwing beer cans out the window of the car. Police stopped the car at Mountain Avenue and Seventh Street and issued citations for minors in possession of alcohol. The complaint about barking dogs in the 500 block of First Street was handled by communication, which means that dispatch recognized the address and knew no one was home. A message was left for the Code Enforcement Officer to go by later when the owners were available. A 24-ounce framing hammer was found in the town hall parking lot. Originally thought to be a lost item, investigators discovered it was town property from the garage behind town hall. The loud music emanating from a vehicle at South Third Street and Nebraska Avenue was not doing so when police arrived. The officer reported all quiet. A concerned citizen reported that the lights at the ball field at Town Park were still on at 9 p.m.
A citizen reported water coming up from a manhole cover in Bunyan court. A caller from Ivy Stockwell Elementary School called to report a child walking home whom they thought too young for the unaccompanied journey. Wheatridge police identified a vehicle parked in suspect circumstances and a check showed the owner to be living in Berthoud. They called Berthoud police to notify the owner, but the owner was no longer at the Berthoud address. Police stopped some pedestrians at Second Street and Versaw Court at 12:30 a.m. They said they had been working late. A written warning was issued to residents in the 500 block of First Street for barking dogs. Police responded to a physical disturbance between a man and a woman in the 600 block of Ninth Street. On person went to jail. A short time later, police responded to another physical disturbance. This disturbance on E Colorado Avenue was between a mother and child. No one went to jail. An hour later, police responded to a child out of control in the 800 block of Welch Avenue. A teen runaway reported from Willow Drive returned home. Police responded to Third and Mountain on a report of kids throwing rocks, but were unable to located the mischievous juveniles. A person being dropped off at their vehicle parked at Berthoud High School at 11:20 p.m. struck someone as suspicious and they reported the incident to police. A Cheyenne Drive resident reported a door-to-door sales person selling seafood. The solicitor was gone when police arrived. Police determined that a disturbance in the 1700 block of Wales Drive was verbal in nature. The loud music in the 800 block earned the noisemakers two warnings from police. Juveniles in Town Park at 11:20 p.m. were warned that the park was closed at that hour. Police are working on a report for the investigation of a “cold” burglary at Brick Oven Pizza. Cash was taken and the case is under investigation. Police responded to a report of kids breaking windows at Berthoud High School, but found neither damage nor vandals. Someone reported a white Buick in the Town Park parking lot at 8 p.m. It had been there for an hour and the caller thought that was unusual. Kwik Korner reported someone driving off without paying for their gasoline. A suspect was identified and returned to pay for the fuel on April 21. A report is to follow in the case of kids throwing rocks at other kids in the 500 block of Bunyan Avenue. What was reported as a physical disturbance in the 100 block of Third Street turned out to be kids using a punching bag. They were warned about the noise. Police received a call about a vehicle sinking into Carter Lake. Rayburn Harman, a 22-year-old Berthoud resident made the 911 call stating that the vehicle he was driving had a malfunction and was in Carter Lake. An investigation by Berthoud police and Larimer County Sheriff’s Deputies found no indication of an auto in the lake. A search by towed sonar was followed the next day by the Larimer County Dive Team. Again, there was no indication of a vehicle in the water. 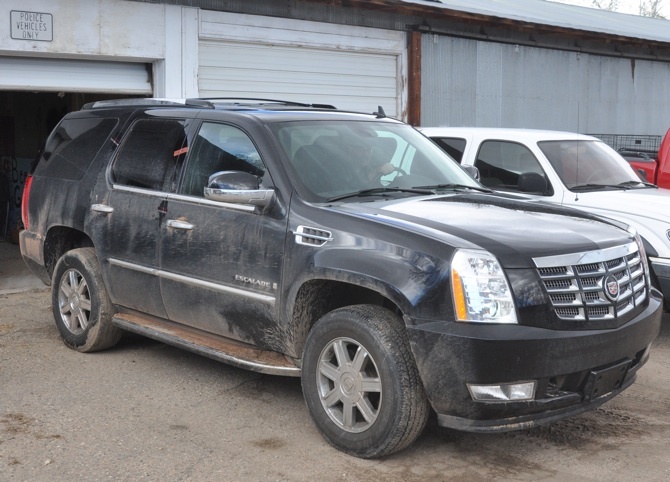 The vehicle in question is a black 2007 Cadillac Escalade owned by a local automobile dealer. The car was taken for a test drive and not returned. Harman and the vehicle are missing. Harman is considered a missing person and the vehicle is considered stolen. Mr. Harmon is the subject of an investigation by the F.B.I. and may be despondent. Police warn of a concern for the safety of anyone contacting Harmon. If you see him or the vehicle, which may have a Wyoming license plate 901 SAB, call Berthoud Police at 970-532-2611 or call your local law enforcement agency. Officers had a chance to make several follow up calls. Only one traffic stop is listed and that driver received a verbal warning. Police are investigating an assault reported in eh 600 block of South Ninth Street. Juveniles in the parking lot in the 800 block of Mountain Avenue were issued a written warning. Due to vehicles having been damaged in the parking lot, businesses in the shopping center will call police when juveniles are loitering. Juveniles reported to be climbing on containers in back of Grace Place were gone when police arrived. An after hours visitor to Berthoud Park was issued a verbal warning. A lost bag of military clothing was left at the back door of Town Hall and the police tracked down the owner and returned the lost items. Suspicious noise inside the building at High Country Proco at 1 a.m. was a cause for concern. The officer on duty handled the situation. The officer also had to handle a situation at the high school parking lot where one vehicle was blocking another. A man was reported to be walking on US Highway 287 with a gas can in hand. An officer went to assist, but was unable to locate the motorist. A report was taken from the 700 block of Second Street about a missing, presumably stolen, license plate. Loud music in the 300 block of South Eighth Street brought a 7:15 p.m. visit from police. A citation was issued in the 700 block of Bunyan Avenue to Adrian A. Carrion, 26- year-old Berthoud resident, charging Illegal Operation of Off-Road Vehicle on Street and Operation of an Uninsured Motor Vehicle. A dog bite in the 300 block of Eighth Street led to a citation for Charles Eason charging Vicious Dog, No Rabies Tag and No Dog License. Police issued a verbal warning for a boat and trailer parked on the sidewalk on Munson Court. A chain attached to buckets was stretched across Spartan Avenue at 2 a.m. The road hazard was reported by a resident and handled by an officer. A small brown dog was running loose near Grandpa’s Café. It was captured and sent to the Humane Society. Police made four traffic stops between midnight and 5 a.m.
Four horses on County Road 13 were referred to the Larimer County Sheriff’s Office. A verbal disturbance in the 200 block of Second Street was a dispute over a child custody issue and the officer intervened. Two students at Berthoud High School issued summonses charging Possession of Drug paraphernalia. One of the juveniles was also charged with Possession of Marijuana. A medium size brown dog reported running loose in the vicinity of Fifth Street and Welch Avenue was gone when police arrived. The stolen Cadillac Escalade was recovered in Windsor just before midnight. Police looked for a speeding black Volkswagen in the vicinity of Berthoud Park, but found nothing. When police responded to a complaint about a semi-truck parked on private property at 190 Bunyan Avenue at 10 p.m., they found the truck gone. Rayburn Scott Harmon, a wanted fugitive, was taken into custody in Johnstown about midnight. Harmon has been the subject of a two state manhunt since he reported the car he was driving was sinking in Carter Lake. His two state rampage included the holdup of a Wal-Mart store in Wyoming. Multiple agencies were involved in Harmon’s case and apprehension, including The Weld County Sheriff’s Office, Larimer County Sheriff’s Office, Larimer County Emergency Services, Johnstown Police Department, Windsor Police Department, Fort Collins Police Services, Loveland Police Department, Larimie Wyoming Police Department, Cheyenne Wyoming Police Department, the Federal Bureau of Investigation, Berthoud Fire Protection District, Loveland Fire Department, Thompson Valley Emergency Medical Service, Larimer County Dispatch, Loveland Dispatch and Weld County Dispatch as well as Berthoud Police. Berthoud police had issued the outstanding warrants and took custody of the prisoner who was taken to the Larimer County Jail. Harmon faces charges of Aggravated Motor Vehicle Theft, False Reporting, Felony Bond Conditions Violation and Armed Robbery. There are also pending charges from the Johnstown Police Department, Cheyenne Police Department and the Federal Bureau of investigation. The 2006 Cadillac Escalade that Harmon had been driving had been taken for a test drive from King Buick, GMC of Loveland. King representatives retrieved the vehicle from the Berthoud Police on Wednesday afternoon. The car was in need of a wash, but had only minor damage. The front bumper had suffered damage when Harmon ran into a snow bank in Wyoming. An abandoned Lincoln automobile was towed from the 400 block of Indiana Avenue. The case of juveniles urinating in Town Park was referred. The officer on patrol at midnight found a door open at 120 Bunyan Avenue. A Fifth Street resident complained about a vehicle driving up and down the alley at one o’clock in the morning. The police found no criminal activity. The Code Enforcement Officer was unable to locate the site of reported trash dumping on Weld County Road 7. He returned later and did find the reported location, but was unable to determine if this was a new or old dumping. Responding to a report of juveniles in Town Park throwing a knife, the officer determined that the “knife” was actually a stick. A Sixth Street parent reported that their son had been shot at with a BB gun the previous day. An officer contacted a suspicious vehicle at Little Bear and Mount Massive Drive. The driver, Kent Knutsen of Berthoud, was arrested on an outstanding warrant for failure to appear and was cited for driving a motor vehicle while his license was under restraint. Police went to the 400 block of Longs Peak Avenue to pick up a Chihuahua from a back yard. The resident had rescued the dog when it was running loose in the street and put it in the yard. However, the Chihuahua had escaped. An abandoned vehicle at Fickel Park was apparently not abandoned. It was gone when police arrived. Police checked out a report of kids hiding in the trees near Spartan Avenue and Eighth Street. The found no one there. Police responded to a verbal disturbance on Count Road 10E, but it was only the Reflections for Youth bus driver yelling at some kids. A noise complaint about a verbal disturbance in the 500 block of Fourth Street led to the arrest of John J. Shilling of Berthoud for contributing to the delinquency of a minor, possession of marijuana and possession of drug paraphernalia. A man walking with a flashlight in the 1500 block of Fourth Street at 10:30 p.m. was reported as suspicious. A report of a suspicious vehicle at Highway 56 and Mount Massive Drive resulted in the arrest of Samual J. Bandiera, a 20-year-old Longmont resident, on outstanding warrants for failure to appear and failure to comply with court order. An officer dealt with the situation of the barking dogs in the 500 block of Welch Avenue. A person in Town Park at 9:17 was informed about the park hours. In a case of mischief, yard lights were broken in the area of Kansas Avenue and Greenwood Drive. Report at 3:26 a.m.
A mailbox was knocked off of its post and damaged in the 300 block of South Eighth Street. Reported at 3:48 a.m.
More mischief in Hillsdale Subdivision when a resident in the 500 bock of South Ninth Street reported that someone had dumped trash on her vehicle. A resident in the 100 block of E Michigan Avenue found catsup on the front door. Police found the barking dogs on Munson Court and issued a written warning to the owners. Boxes in the street on Mountain Avenue constituted a road hazard and were removed by police. A calf was reported to be on the road at Spartan Avenue and County Road 17 at 4:22 p.m. The calf is listed as a road hazard and the situation was handled by the officer. A South Ninth Street resident reported a door-to-door salesman. However, he was not selling anything. Police investigated a report of illegal parking on Longview Avenue. They found a truck legally parked and having current license. A caller from Lake Avenue reported hearing an air gun being shot. A solicitor selling vacuums door to door on East Colorado Avenue was gone when police arrived. Police found no criminal violation by a dozen Juveniles playing football in Bein Park at 9:30 p.m.
A Fourth Street resident was issued a written warning for burning trash. Several middle school age juveniles climbing on the roof of the Wayside Inn were issued citations for their behavior. It was hit and run accident of sorts in the 1700 block of Wales Drive. The driver went off the road and damaged a fence. He ran away on foot, but was captured and the vehicle was towed and he went to jail. His driver’s license was revoked and he should not have been driving.